We are happy to announce that two of our does earned ADGA Superior Genetics awards. Those does are Annika (5*M Old Mountain Farm Mishell Anet VEEE89) and Lois (6*M The TinyHillFarm’s SuperLois). We are also very excited to learn that our home bred doe, Lois made ADGA’s Elite Doe list. Lois is ranked the top 3% nationally. Not too bad for a yearling first freshener! She’ll also earn her dairy star this year, making her a 6*M milker. Lois’s sire is *B Sugar Moon V High Roller, and her dam is 5*M Old Mountain Farm Mishell Anet VEEE89. Lois is named after the S shaped spot on her side, and it looks like she’s really living up to her name! She is bred to Phoenix Farm Hard Candy (SG NC Promisedland SS Deviant *S *B X SGCH Phoenix Farm Rock Candy 5*M). Looking forward to meeting those kids in March! We have started taking deposits for 2017 kids, so if you are interested in adding a Tiny Hill Farm goat to your herd, please contact us. Our herdbook and kidding schedule has also been updated. 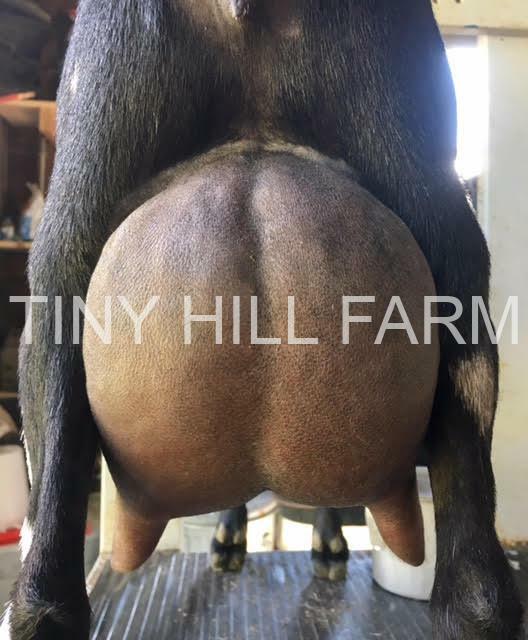 Lois’s udder is pictured below. Thanks for visiting!